Invariably overlooked, always misunderstood, seldom studied and always there……heteropods, a bizarre group of pelagic molluscs. They are amongst the most widespread and successful groups of peculiar planktonic predators. They are found from the surface waters to the abyssal depths, from the tropics to the poles. Their group name refers to their "different foot" and when compared to other swimming molluscs this is certainly the case. Some species progress at great speed by a sculling action of the single median, expanded and flattened foot and can fly forwards or backwards, right way up an upside down. The lower part of the foot is, in some species, equipped with a drogue parachute used, it is said, to slow sinking. The typical molluscan shell may be dominant, diminutive or disappeared! The paired and very dominant eyes have cylindrical retinas, powerful plano-concave lenses and an optical design that no-one can understand. All heteropods are voraciously predacious, some possibly even parasitic. 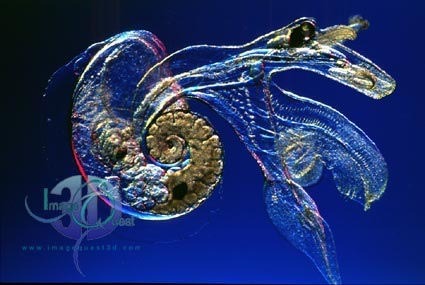 They particularly feed upon other planktonic molluscs like pteropods. Large deep sea heteropods can rasp nasty holes in unwary fingers and their owners can be 35 cm long. Their teeth are in the form of a radula - a conveyor belt of wickedly sharp plates that act a little like an oil exploration rock drill! Off British coasts, on warmer Gulf Stream currents, the dominant genus is Atlanta, which we illustrate here - amongst the smartest of humble heteropods.